The Drought of 2012 left its mark on Arington Tree Farm, no question about it. The heavy heat and extremely dry conditions wreaked havoc on the grass, flowers, crops and trees growing throughout the farm. The grass and perennial flowers will bounce back but the trees aren't as forgiving. The first 10 years of a tree's life are when it is most vulnerable - too much moisture, too little moisture or heavy wildlife browse can lead to its demise. Thus, the repeated hot, dry and windy days over the course of summer 2012 definitely took a toll. Depending on their age, location and soil conditions, some trees handled the heat better than others. 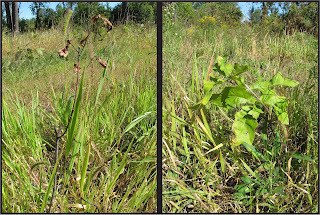 Oak seedlings planted by students on Arbor Day 2012. The oak on the left fell victim to the drought conditions. 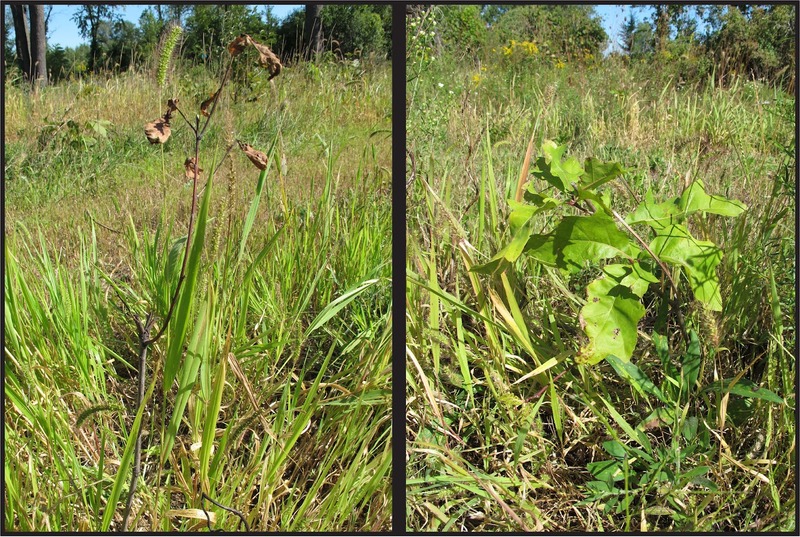 The cherry, red oak and spruce seedlings that were planted by 4th grade students on Arbor Day this past April did not fare well. Nearly 50% of the 300 trees planted that day have died. Despite being watered during the midst of the drought, the shock of transplant and a less-established root system coupled with the severe heat and lack of rain were too much to overcome. 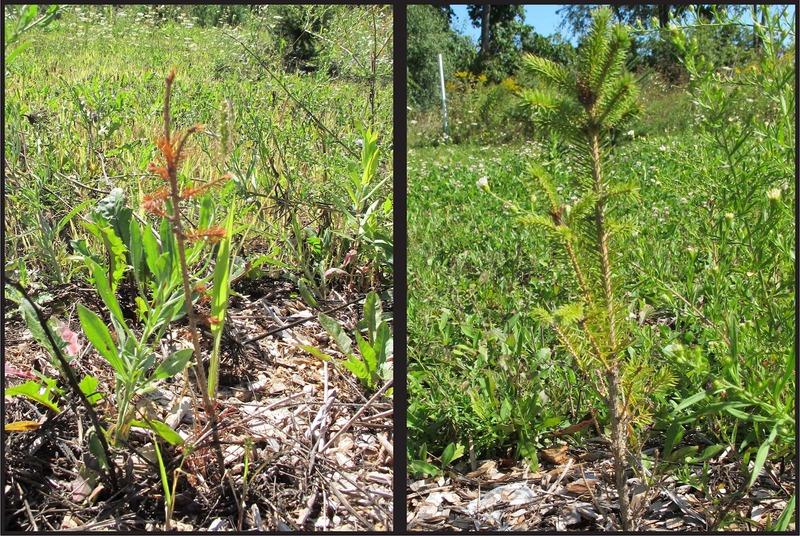 Spruce seedlings planted on Arbor Day 2012. 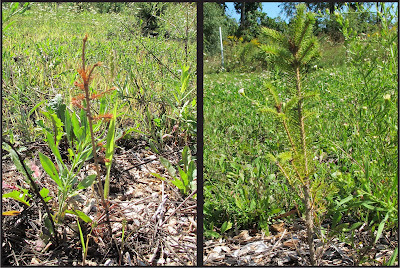 The spruce on the left did not survive the drought; wood chips were laid in order to help keep moisture in the soil. Five-year old white pines also fell victim to the heat. These pines, dotting a south-facing slope, suffered especially hard due to the sandy, dry soil conditions. Additionally, with ample spacing around them, they weren't able to shade one another - a cooling mechanism naturally occurring in woods or tree plantation. This natural "system of defense" helped protect many of the trees on the farm. Our tamaracks also had a difficult time with the heat. Tamaracks are a neat species; they are the only deciduous conifer, meaning they lose their needles each fall. However, they're a species that prefers wet soil - something that was hard to come by this summer. About 25% of our 12-year old stand did not make it. Again, with nature's built-in defense, the trees on the inside of the stand fared better than those on the outside. 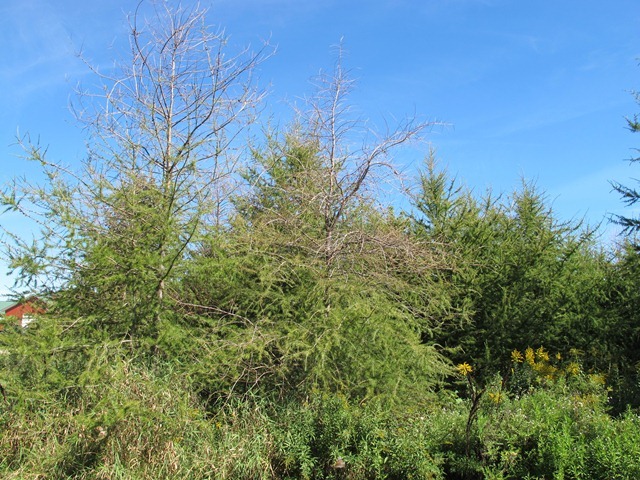 The dead trees will be cut down and mulched, to be used around tree plantings elsewhere on the farm. Our stand of tamaracks. The trees on the inside of the stand fared much better than those on the border. Here, two trees have die-back on their top 50%. Come spring bud-break season, we'll have a better idea just how deadly the drought of 2012 proved to be. It's possible some of the trees will be able to bounce back, particularly those where only the top half of the tree is dead. We'll update on the progress this spring!